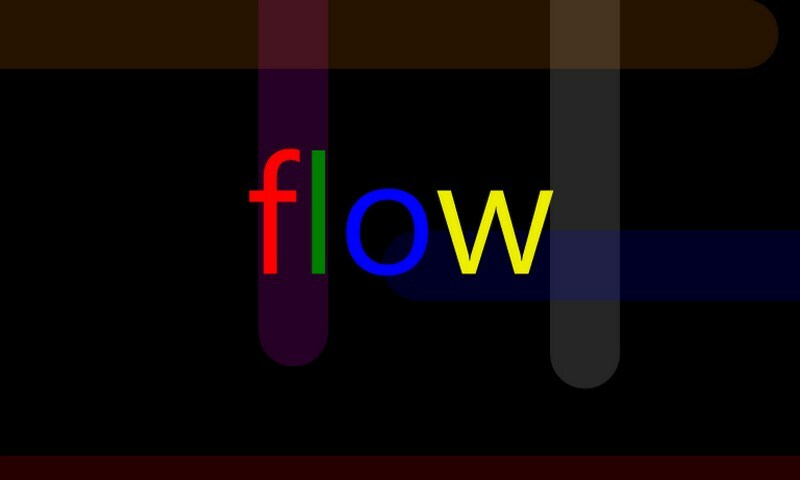 Flow Free – Games for Windows Phone 2018 – Free download. 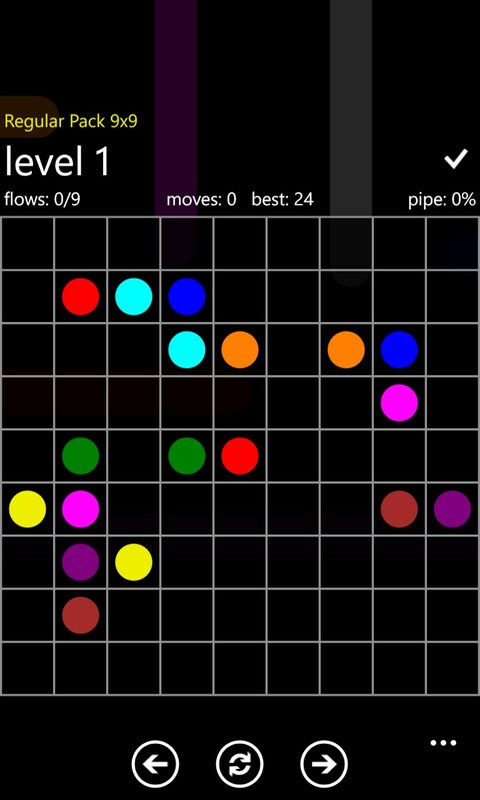 Flow Free – Connect colored circles by drawing lines between them. 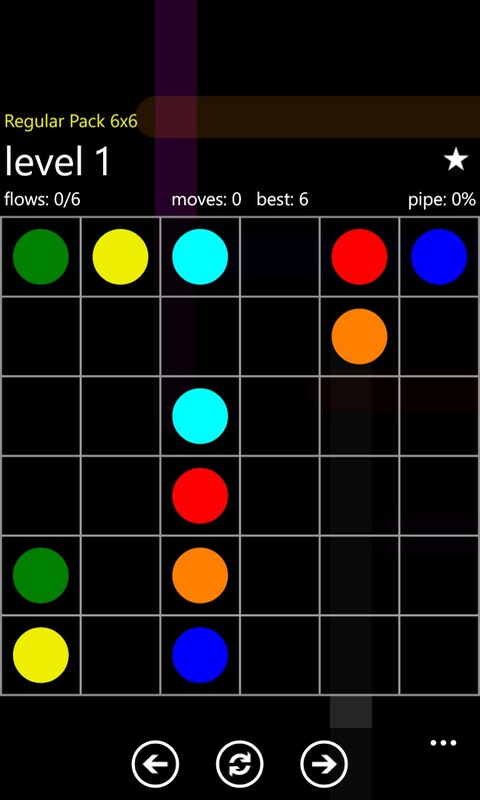 Flow Free is a very simple in design and incredibly addictive puzzle game for Windows Phone in which you will be required carefulness and diligence. 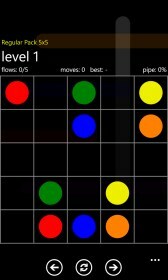 The essence of the game is plain - you have to connect all the pairs of colored discs with each other. 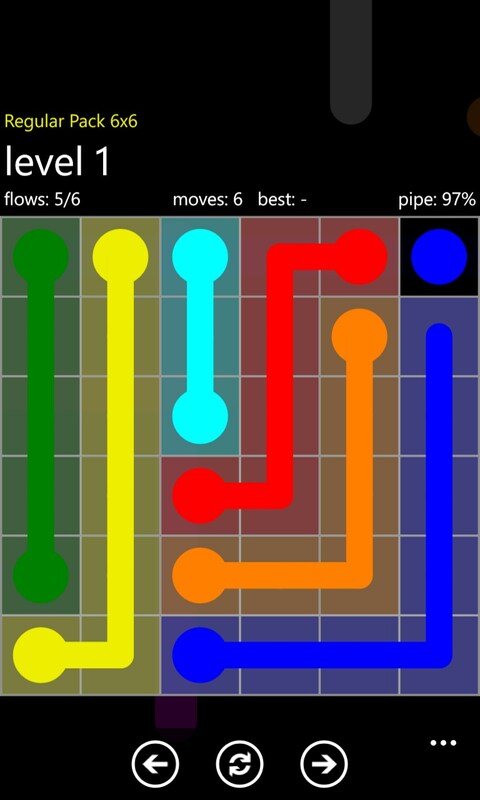 However, to solve this problem is rather difficult, because the colored lines must not cross each other. 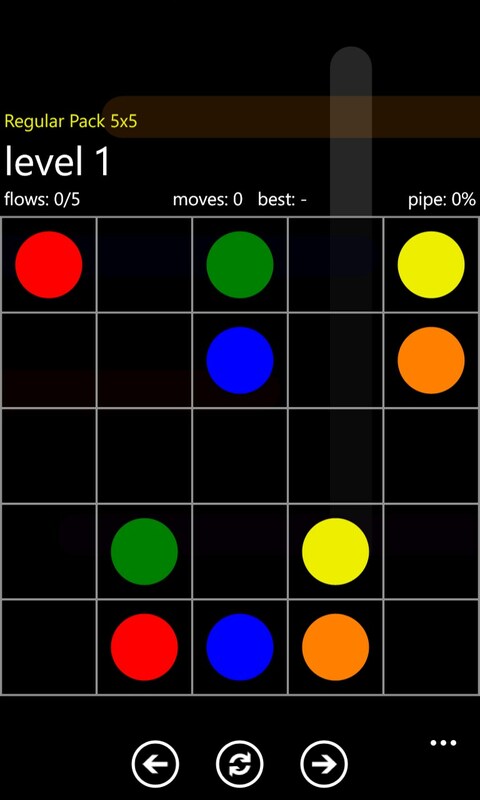 You have to find the only sure way to solve the puzzle, and it is desirable not to use a number of moves bigger than that of the color circles' palette. 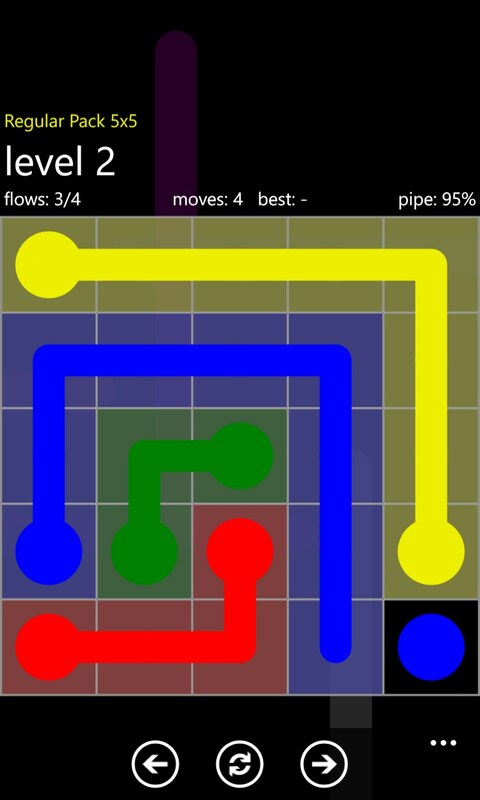 That is, the number of colors on the playing field is the number of lines that you have to draw, ideally. For each corrected line you will receive penalty points, and if there are too many corrections, you will receive for solving a level a regular check, not a star. However, the game is marketed primarily as a time-killer with the help of which you can have a good time on the road or waiting for something, and it means that all the promotion is sidelined. 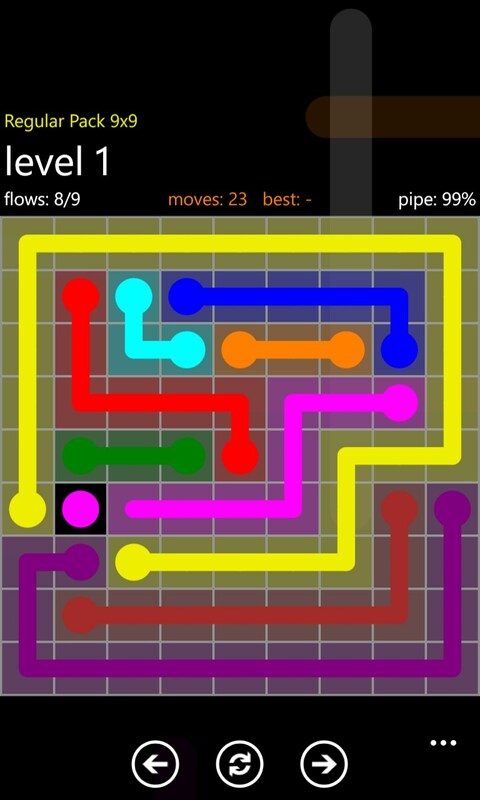 This opinion is also confirmed by the fact that you can run any level not bothering yourself with solving the previous ones in strict sequence. 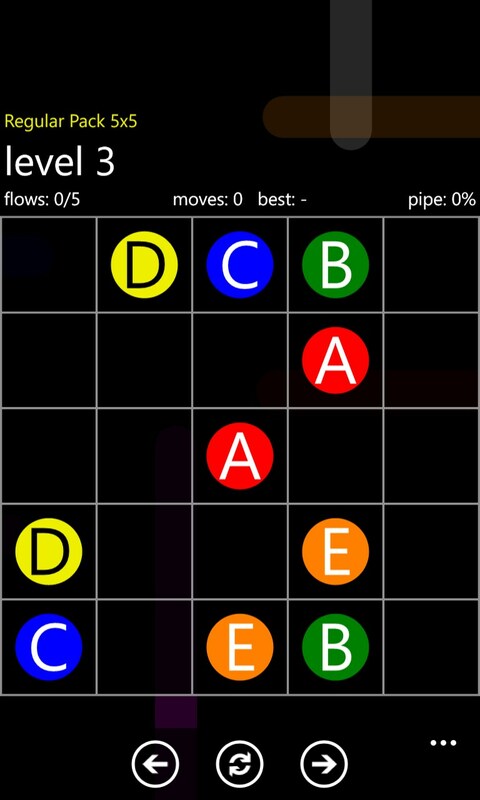 The game has a huge number of levels divided into several modes. In its main menu, you will see the modes of "Free play" and "Time trial". The first mode has two submodes - "Regular Pack" and "Bonus Pack". Each contains 150 challenges which are divided into five modes further, differing from each other in size of the playing fields, that is complexity. The simplest would be challenges where you will need to connect 4 pairs of colored discs on the board with the size of 5x5. There are also modes of 6x6, 7x7, 8x8 and 9x9. Naturally, the number of circles in each of them will be larger, and their palette will expand significantly. In the "Time trial" mode, you can select the size of the playing field (from 5x5 to 9x9) and the amount of time that you are going to spend for the game (from 30 seconds to 4 minutes). 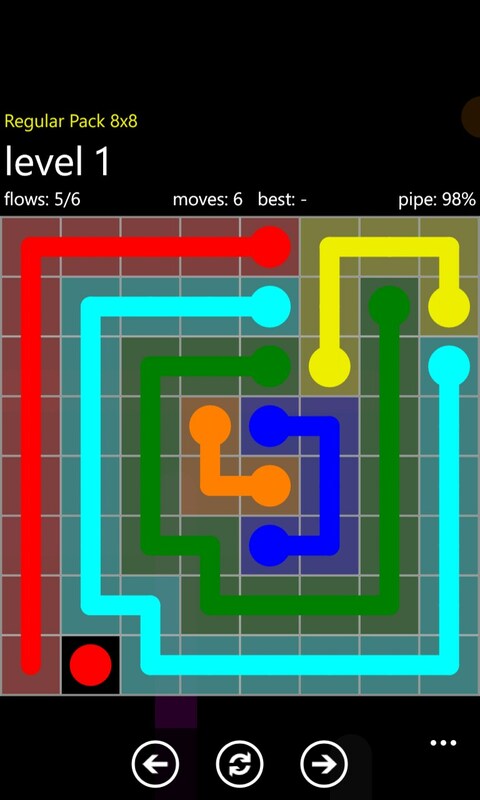 The number of levels in this mode is limited only by your capabilities. That is, your challenge will be to solve the maximum number of puzzles for the selected amount of time and to set a new record. Controlling in the game is very simple. Tap the selected circle and start to draw a finger along those cells that you believe are correct. Once you tear your finger off the screen, the line will be broken. Should you cross the old line with the new one, the old line gets interrupted, after which you will have to look for a new path for it. As it has been already mentioned, the game is designed very simply, but in terms of graphics it is made flawlessly. All colors are very bright, and for people who have problems with color vision there is a mode in which the similar circles are marked by the similar letters of the alphabet.